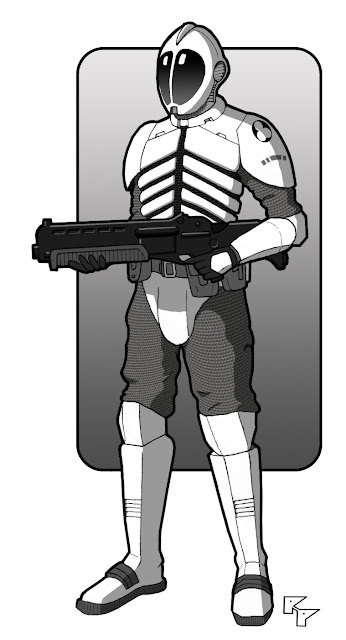 Essentially a stripped down version of the standard non-powered trooper armor, Zhodani light combat armor eliminates the upper arm and leg armor and utilizes a ballistic cloth body suit. The armor is not suitable for use in vacuum and sacrifices some protection for lighter weight, lower cost, and increased maneuverability. The armor can be augmented with the typical accessories and equipment. (See Alien Module 4 - Zhodani p. 16). The armor is favored by troops who expect light combat or combat by lower tech combatants and is often the preferred armor for garrison duty and for patrolling civilian areas under occupation. Cr16,000 TL11, Weight: 4 kg. I've still been too busy combating the forces of evil (i.e. 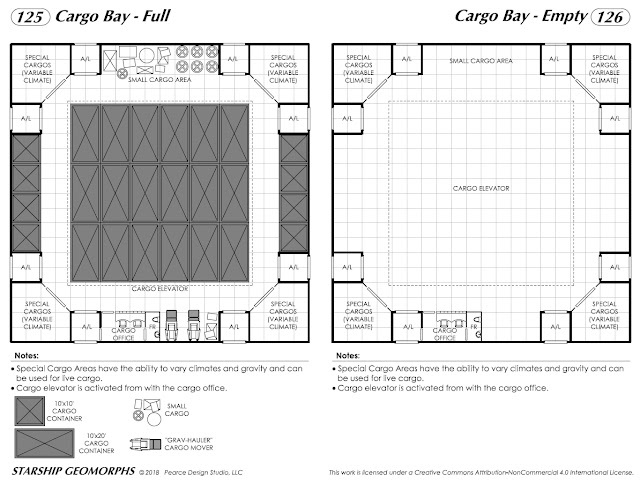 "real life") to make any new progress on the Starship Geomorph book, so here are a couple geomorphs of a simple cargo bay - one full of cargo and the other empty - to tide you over. The illustration depicts a common scenario many Travellers might have experience with - the critter infestation in the cargo bay - and the stalwart ship's security agent about to have a close encounter. The insect model was created by ShinbiHAJI and can be found at the SketchUp Warehouse.